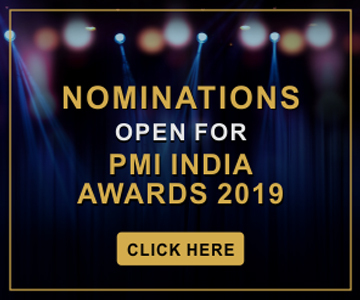 It was an eventful November last year with the PMI India Champion Program organizing the Champion annual awards for 2014, along with the second Champion Designate Graduation Ceremony, on 29 and 30 November at Fisherman's Cove, Vivanta by Taj, Chennai. As many as 51 Champions, Champion Advisory Council (CAC) members, and Champion designates travelled from across India to attend the ceremony. 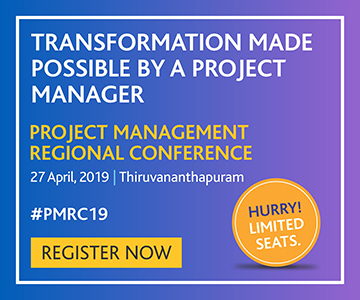 It started with a keynote address by Mr. Raj Kalady, managing director, PMI India, in which he welcomed the attendees to the event. Mr. Vivek Sonar, chair, PMI India Champion Program, spoke on the theme of the PMI India Champion Program and emphasized on the program objectives that provided new members better clarity on the program. 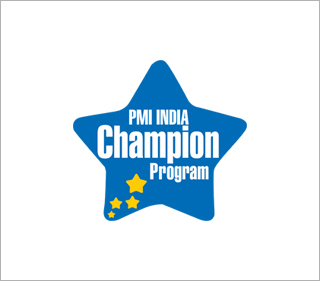 During the graduation ceremony, Mr. Kalady, along with CAC members, pinned 'Champion badges' on Champion designates as a token of their graduation into PMI India Champions. New Champions, Ms. Shweta Katre, Ms. Richa Gupta, Ms. Ritu Mehta, Mr. Vipin Shrotriya, and Mr. Sathish C. shared their experiences of being a part of the program as Champion designate. Distinguished guests for the occasion were Chennai Chapter board members. Chapter president, Mr. Subbiah V., along with Mr. P. Ramasubramaniam, Mr. Siva Kumar, Mr. Koushik Srinivasan, and Mr. Sriram R. attended the ceremony. Mr. Subbiah spoke about chapter activities and the avenues for collaboration between the chapter and Champion Program. The day ended with a vote of thanks by Ms. Susweta Mukherjee, member, CAC, Mr. Visukumar Gopal, member, CAC, and Ms. Suvarna Naikdesai, administrator, Champion Program. During the next day, there were interactions and networking between Champions and CAC members, and assigning of mentors to the new Champions. 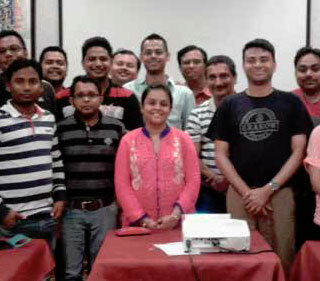 On 6 December, PMI India Champion, Ms. Dipti Trivedi, PMP, conducted a global project management training at Forbes Marshall, Pune. The workshop was designed with the objective of helping participants to gain in-depth knowledge of project management concepts and their real-life application. The content included contemporary and real-life project management issues and approaches. Around 12 members of varied work experience attended the workshop. PMI India Champion, Mr. Kiran Rajeshirke, PMP, closely worked with the National Institute of Industrial Engineering (NITIE) in Mumbai in understanding the expectations of students from PMI India Champions in terms of guidance and knowledge-sharing in the field of project management. He organized multiple Webex sessions to speak to NITIE students. These efforts resulted in 11 of the participants earning Project Management Professional (PMP)® and four earning Certified Associate in Project Management (CAPM)® certifications. The program will continue to provide guidance to 40 students who have expressed interest in taking up the PMP® certification in June 2015. PMI India Champion, Mr. M. Manikandan, PMP, organized a session on the value of project management at Nokia, Chennai, on 3 December. The session was delivered by Mr. Visukumar Gopal, CAC member, and was attended by 27 Nokia employees. Mr. Manikandan, with the help of PMI Chennai Chapter, also organized a 35-hour 'PMP® & Beyond' contact session at Nokia, Chennai. The workshop was organized over four days in December in which 12 Nokia employees participated. Seven of them have expressed interest in taking up the PMP® certification exam shortly. On 3 December, PMI India Champion, Mr. Sathish Chandrasekaran, PMP, conducted PMP® and PMI awareness sessions over Webinars across multiple locations of Cognizant. 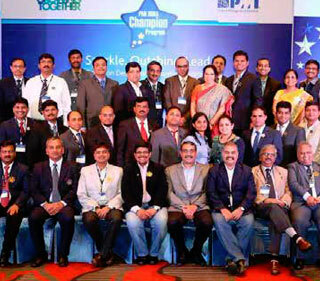 The sessions were attended by over 150 project leaders and project managers of Cognizant. As part of 'PMI Curtain Raiser' sessions, he spoke about different certifications, including CAPM® and PMP®, and career growth. Mr. Chandrasekaran also conducted 'Project Management and Beyond' awareness sessions through Techgig. The sessions were attended by over 200 participants from various industries. He spoke about project management as a discipline, PMI certifications, and case studies of good, better, and bad projects. 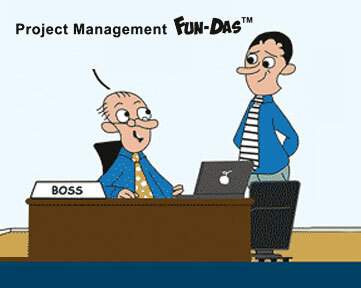 He also touched upon certain myths and facts about project management. PMI India Champions, Mr. Sonik Chopra, PMP, and Mr. Prasann Patil, PMP, conducted a session as part of the 'Agile Webinar Series - Managing Projects' on 'What is takes to succeed at PMI-Agile Certified Practitioner (PMIACP) ® certification' in Cognizant on 17 December. They discussed the examination content online and the relevance of the PMI-ACP® certification in the current business environment. Around 200 participants from across India attended the session. Mr. Patil also conducted a Program Management Professional Certification (PgMP)® introductory session for CSC India on 28 January 2015. The session was attended by 10 CSC project and program managers with over 15 years of experience. Mr. Patil focused on the relevance of the PgMP® certification, ways to optimize one's time to attain the certification, areas of focus, and study methodology. He advised the team to form study groups. CSC is interested to have follow-up sessions to get all 10 project managers certified as PgMP®. Mr. Ananth V. kickstarted a risk management instructor led training session at IMS Health India Private Limited. He has now been asked to lead an end-to-end project management training program with around 35 PMP® certification aspirants. The program will complete in six months, during which time there will be e-learning and instructor led sessions. Mr. Pushpender Jindal, along with his colleague, conducted a workshop for 50 PMP® certification aspirants on project management on 18-19 December at HCL Technologies Limited. Participants have provided excellent feedback on the session and are now charged up to prepare for the exam.